Ans key is (3). Besides the shape and dimension, is distance of image from the screen taken into consideration ? Thanks for your help ! Here you have to consider what shape will the shadow take by considering the shapes, given that only one sheet allows light to pass through. Circle is only 3cm in the diameter. So only the top and the middle is 3cm and the rest will be smaller than 3cm. If either the triangle or square is made of a material that allows light to pass through, you will not get a round shadow. Similarly for (2). The circle will be within the square. Hence you will not be able to get this shape. Ditto for (4). You will not get this shadow since the top pointed angle of the triangle. It shd be inside the circle since all 3cm. 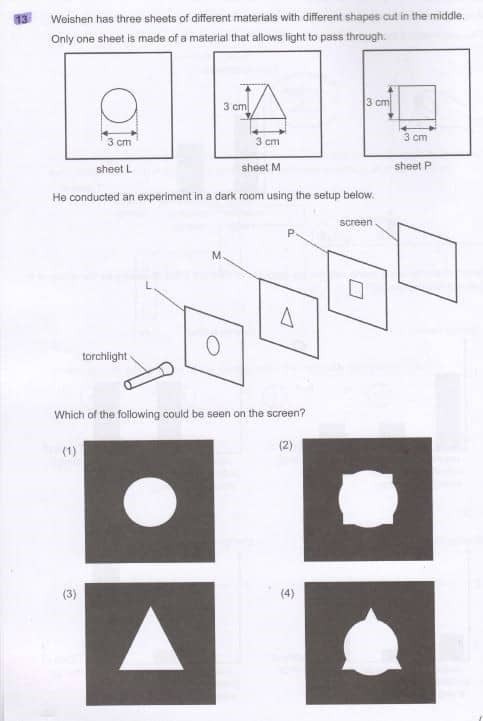 Answer is (3). As the square is bigger than the triangle, no matter what material it is made of, the square shape will not be affecting the shape of the shadow.